Anyone who has lived in Boston for an extended period of time has long observed the mystery and the lore surrounding the infamous Whitey Bulger. The lore was so entrenched that for the most part no one ever thought he would be arrested. Finally the FBI announced that their new strategy for focusing on Catherine Greig paid off with the couple being found and arrested in California. The unbelievable part was that he was in the same place for something like 15 years. 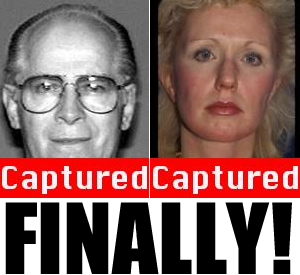 For the Boston area catching James “Whitey” Bulger is like the United States finally catching Osama Bin Ladin. Looking at his booking photos that were somehow obtained by WCVB and WBUR you definitely can see how he blended in. The WCVB one with his glasses on could look like just about anyone’s grandfather. His undoing definitely was his girlfriend Catherine Greig. She definitely looks like some of the photos that were cirulated by the FBI. The irony is that many thought the FBI strategy of focusing on ads during talkshows and ads in Cosmetic Industry magazines was a joke. The press also has aluded to the part of the movie The Departed where Jack Nickolson is talking about how women will take you down. As fascinating as the James “Whitey” Bulger story is the victims of his alleged crimes are more relieved than fascinated. The reality is that Bulger was a brutal person who terrorized people not just in his Boston neighborhood of South Boston but around Greater Boston as well. At first glance his victims families may not get any significant monetary compensation. It was reported that he and Greig filled out paperwork to get free legal assistance even though $800k was found in the Santa Monica California apartment where he was caught.